Bristol Mayor Marvin Rees has scrapped the city centre arena plan in favour of a mixed use development. Proposals for an arena next to Temple Meads railway station were first mooted in 2003 but have been beset by delays. His decision goes against council recommendations and paves the way for a privately funded arena at the Brabazon hangar on Filton Airfield. Opposition councillors said it showed "contempt for democracy." The plan, which began life under the former Bristol Mayor George Ferguson, has cost the city council more than £12m. It has been at the centre of a political wrangle, as well as angering many residents in the city. Bristol City Council passed a motion in favour of the Temple Island scheme on Monday but at the cabinet meeting on Tuesday, Mr Rees said spending more than £150m on an arena was too risky. 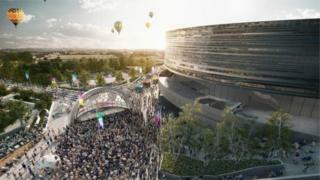 He said: "A mixed-use site, including a conference centre would blow away the arena for jobs and create a stronger tax base and economic output for the city. "Jobs and affordable homes are the key values for the delivery of my administration. I will prioritise them." But leader of the Greens, Eleanor Combley, said: "At the end of the day the only view that matters to Marvin Rees is his own. Liberal Democrat leader Gary Hopkins said: "The decision is a disaster for the cultural and financial well-being of Bristol." The decision comes as it emerged an organiser of the Live Aid concerts made a last-ditch bid to save the planned venue. Harvey Goldsmith spoke to the council a month ago but the mayor's office decided his proposals were not viable. News of the intervention was revealed after a letter was sent to the Bristol Post newspaper. Mr Goldsmith said the chance to build in the city centre was "very rare" and would be a "fantastic" opportunity for the city.